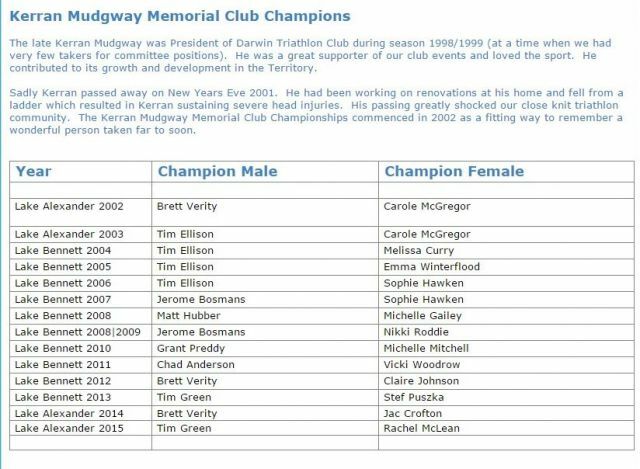 This is a quick E News mainly to convey a few extra details regarding our Kerran Mudgway Memorial Club Championship taking place this Saturday afternoon. If you haven’t done this event before, we hope you are ready for a real Territory triathlon experience. Lake Bennett is a must do race on our calendar and the location and late afternoon start time ensures we will have a very different swim, bike, run experience to that of our usual events. It’s our big club event of the year and will be great to see you all there. With the Championship distance and a short option on offer there is something for everyone. Teams are welcome over both distances. As it is expected to be the usual warm conditions at Lake Bennett, please ensure you have at least 2 (two) full water bottles on your bike for the bike leg (and don’t forget to drink). The usual water station at start/finish area will be in place. Please note: No outside assistance is allowed (ie your supporters are not allowed to hand you water bottles etc on either the bike or run course). We look forward to seeing you all at Lake Bennett at the weekend. Don’t forget to allow extra travel time and to check that you have all your gear before leaving – it’s too far to drive back if you have forgotten your cycle shoes or some other vital piece of equipment (don’t laugh, it has happened more than once)! Please note early bird entry for individuals ($10) and teams ($20) closes 8pm TODAY. 1. Please note we are using the car park at the Resort as transition. If you aren’t booked at the Resort for the night, you will need to park outside. On the way in, it will help if you drive past the Resort gates before parking. We ask that you consider the safety of competitors prior to parking and make sure you are well off the road. 2. Ensure you are well hydrated prior to this event. 3. Bring your own water … it is not recommended that you drink the local bore water. 4. There is a small shop at the Resort selling drinks/ice-cream etc, you may wish to consider bringing snacks. 5. Toilet facilities are located on the pool deck area at the rear of the Resort reception. Please consider guests if you make use of Resort facilities. 6. Don’t forget to slip, slop, slap. 8. If wanting to eat at the Resort after the event we strongly suggest you book a table. There will be a buffet available, call the Resort for details and bookings. 1. We currently have a membership deal ($25) for those non members wishing to join until 30 June 2016 & be able to participate on Saturday and at our next duathlon. It will also give cheaper entry for the upcoming NT Standard Distance. 2. Please email darwintriclub@gmail.com for discount codes. Limited numbers for this deal.